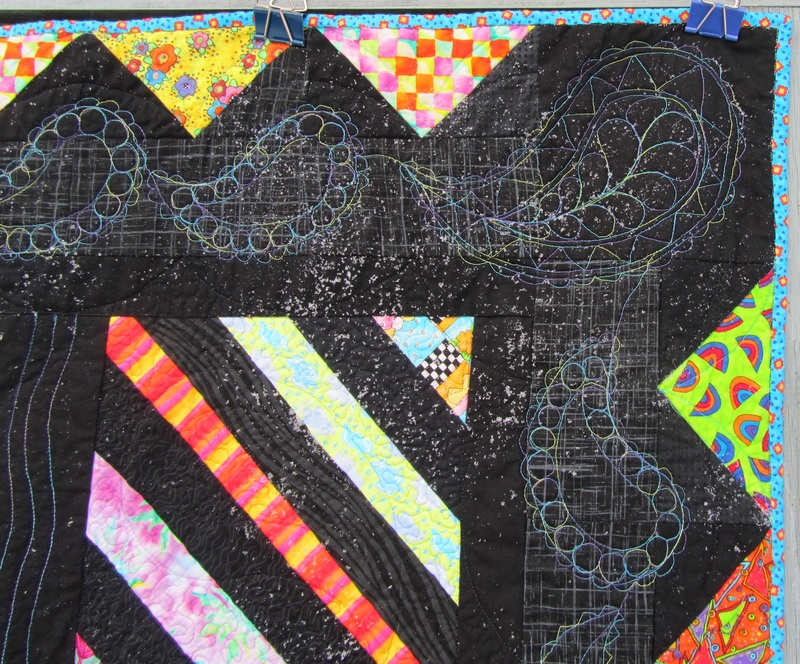 I found a few hours on Monday and Tuesday to get caught up on Step 4 (parts 1 and 2) of the Scrapitude Mystery Quilt that many of us are doing through Sandy’s blog, Quilting for the Rest of Us. It went together very quickly and very neatly. Occasionally, I had difficulty turning patches correctly, but that was my own perceptual problem. I quickly learned to check before I sewed! I am pretty happy with the way this is turning out. It is very scrappy. I wish I had used more variety in the largest triangles, but I think it will be fine. This is my first mystery quilt, and the scrappiest thing I’ve done so far. I’m linking up with WIP Wednesday and Scraptitude Linky Party. Greetings from the frozen tundra! The quilt prints and bunny tracks have been covered twice since I took this photo! 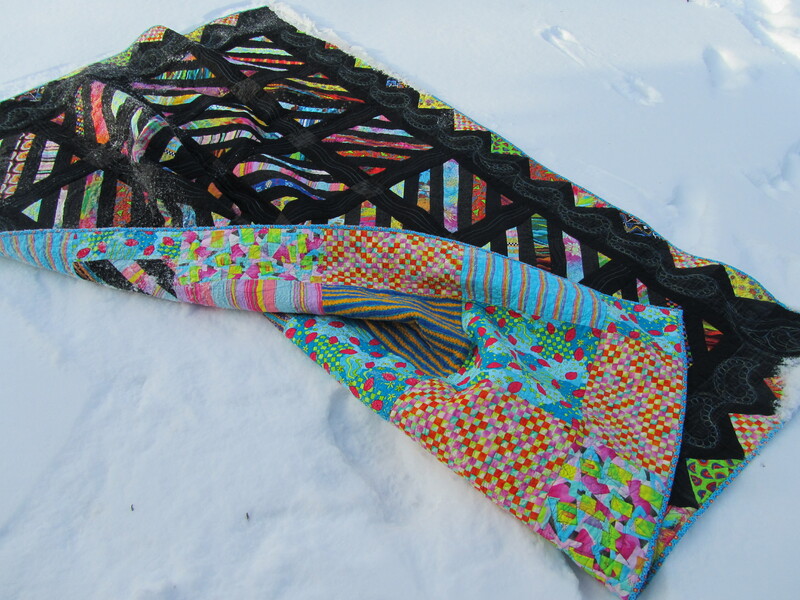 Now the stash numbers look better, since I had the first actual quilt finish of the new year, with the Brights quilt. I’m figuring it at 11 1/2 yards. That seems like a lot, but I know string quilts are very fabric intensive, being mostly seams. 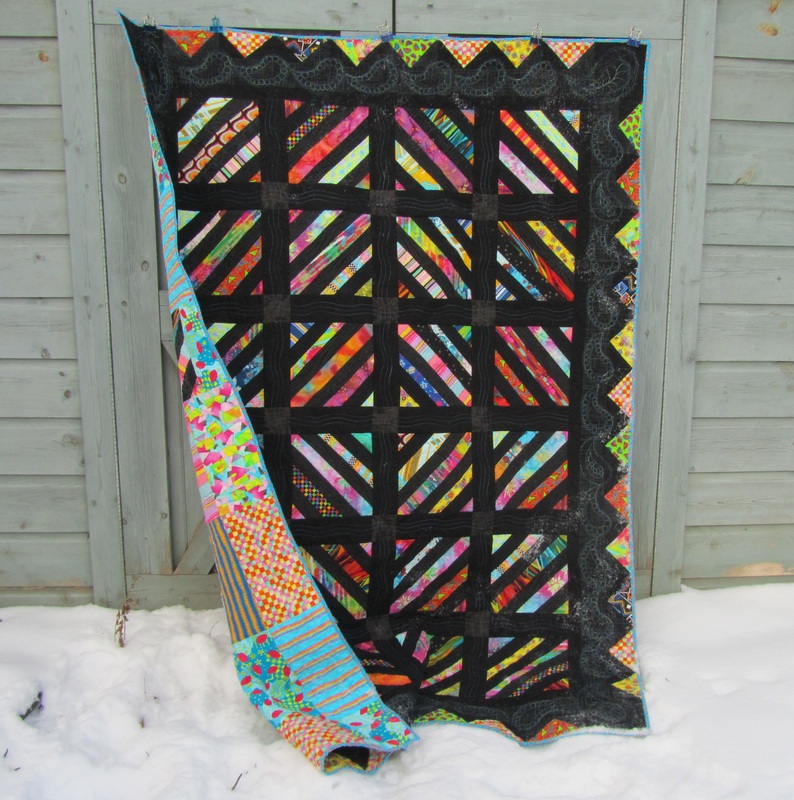 How do you figure out the yardage on your scrappy quilts? If I’ve designed one on EQ7, I use their fabric estimate as a guideline, but I think they are often high (as in, “purchase this much so you’ll have enough”), so I often round down. And I think you develop a sense of it after a while. How do you do it? Hope you’re all getting as much sewing time as you like, and are making a dent in that stash! What started as playing around with some strings that don’t fit into other color schemes evolved into quite a project, but the results are good. I think it says something about my former taste in color that I had this many garish very bright scraps, let alone enough brilliant fabrics to piece the back. I still love color, but not quite as saturated as these prints. 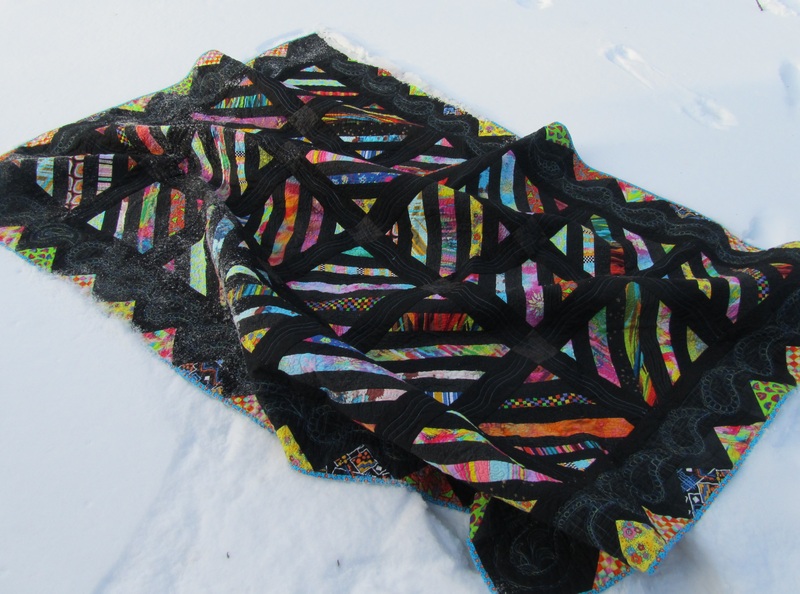 This wasn’t a planned slow quilt, but each design decision along the way led to another. I set the bright strings off with 2″ strips of black prints and black Kona solid. I’m really happy with the visual interest from the black prints. Then I sashed it with black Kona. 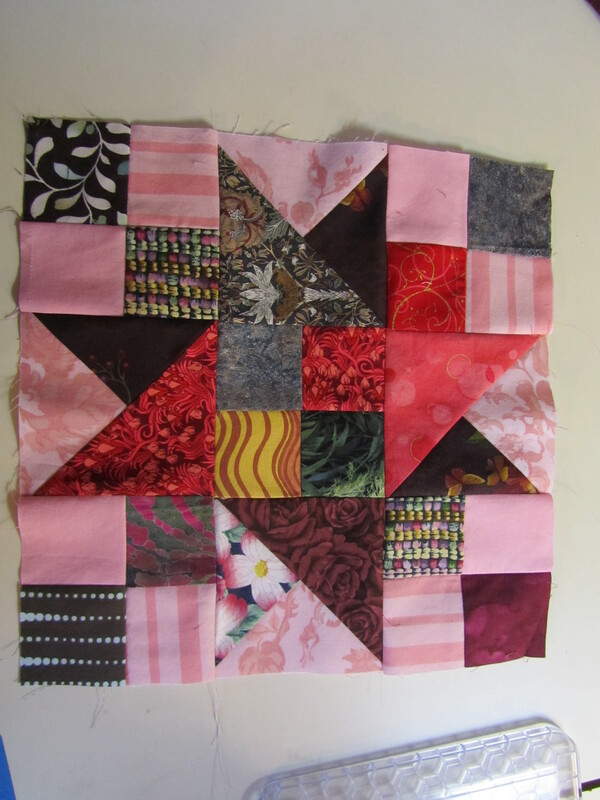 It was beginning to resemble a vintage crazy quilt. 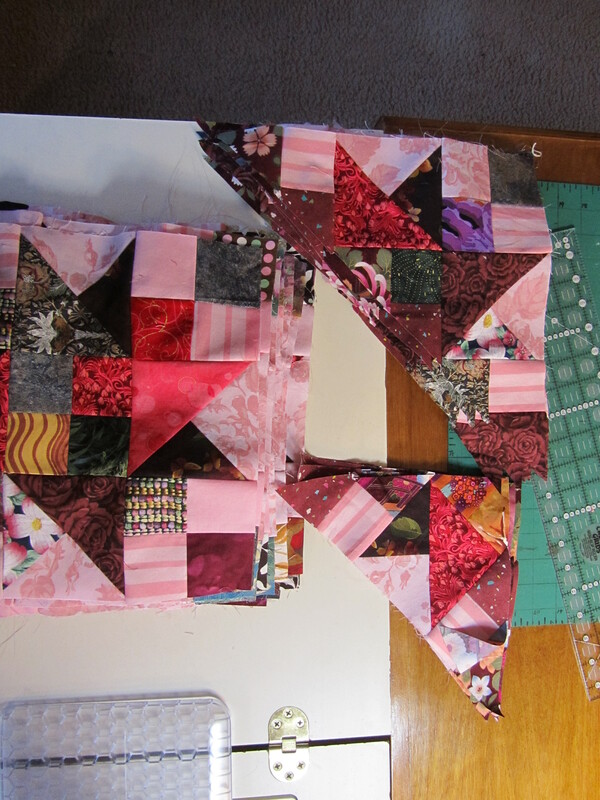 Then the border needed to be black, but not all black, so I pieced in these bright triangles from scraps I had set aside for another project. 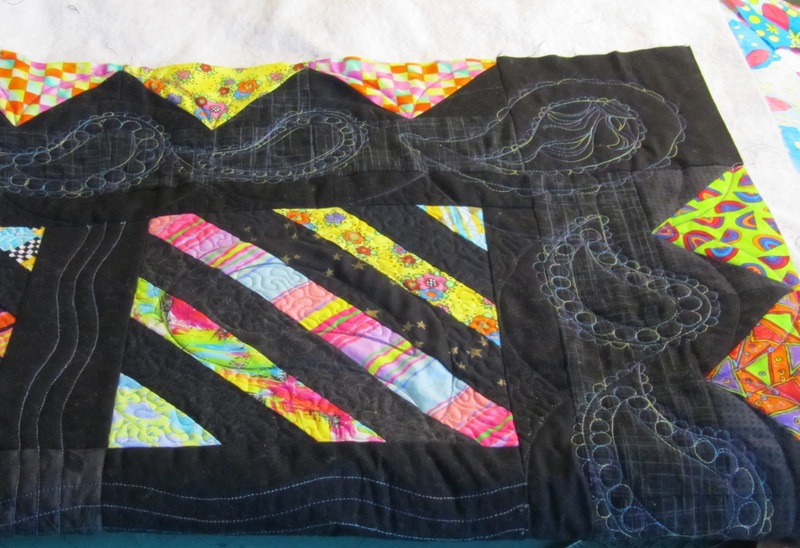 Nice effect, but still too much black, so I quilted wavy lines through the sashing using a purple/teal heavy cotton Sulky thread. I cut basic patterns for paisleys for the border, then free-motioned the details using Superior’s “Lava” in purple/teal/lime. Each corner is different, and I tucked a few surprises into the little ones on the sides. Each block has a basic paisley surrounded by stippling. Marking was tricky, because of the contrast in color. First, I cut sticky templates from Contact Paper, and tried to sew around them. That worked, except this large (60 x 84″) quilt scrunched around a lot, and the template wanted to come off. What worked best was to stick the shapes to each block, then trace around them alternating washable marker with white mechanical pencil. 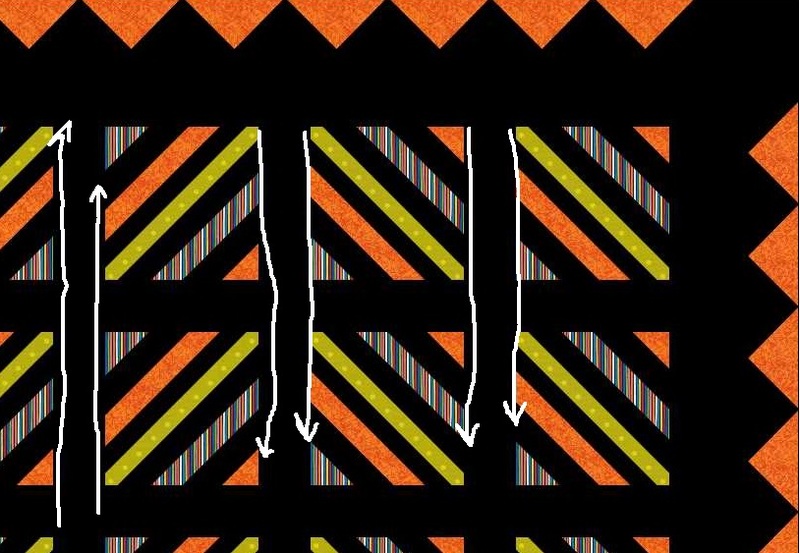 Then I started experimenting with threads. Thin black Bottom Line was invisible on the black stripes, but too harsh on the prints. Regular invisible thread was fine on the prints, but too shiny on the black. I settled on smoke colored invisible thread. It’s visible on some of the prints but very unobtrusive, and blends well into the black, with just a little shine. So this was a quilt for experimenting and learning. And lots of ripping. And it works now that it’s finished. What I would do differently: use a black batting. I totally spaced on that. 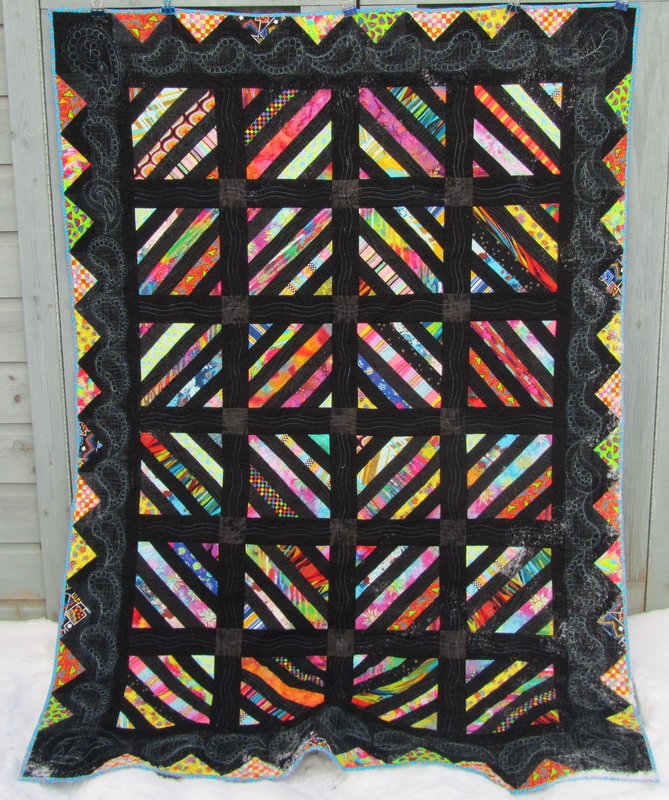 I guess that I seldom make dark quilts. It looks fine for now, I just hope it doesn’t beard down the road. It did cause me to vacuum my studio, which is always a good thing. Hope you accomplished as much as you wanted this week. 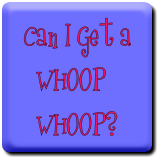 I’m linking up with Finish It Up Friday and Whoop Whoop Friday. Categories: Finishes | Tags: Ca I get a whoop whoop, destashing, Evening in the Garden, finish it up friday, Valerie Root | Permalink. This week I’ve been sewing as much as my back will let me, since I don’t think it would be any better to be out slipping around in the cold and snow. The Brights quilt took FOREVER to quilt, it seemed. Some of that was probably short spats of sewing, some of it was ripping out mistakes experiments, and some was that it has a lot of quilting. It’s all finished now, except for being trimmed and bound, and I’m happy with it. Maybe I can show it on Friday. 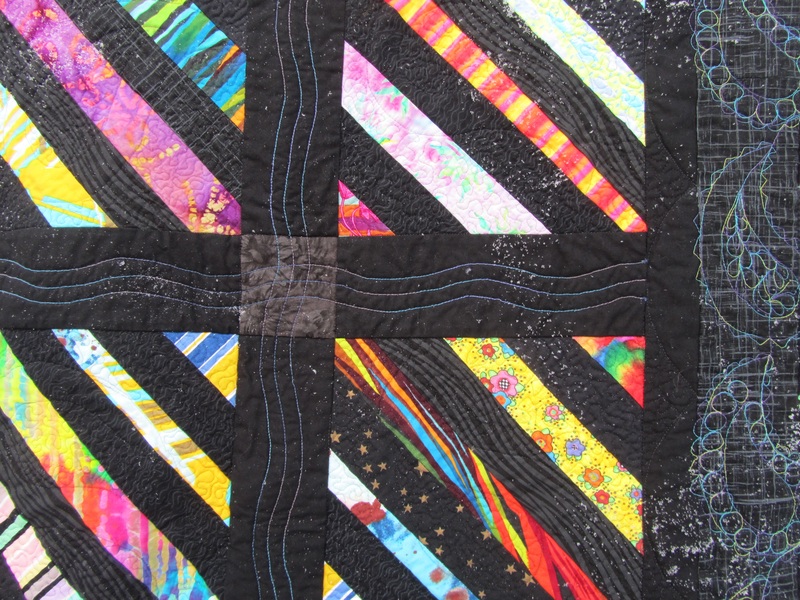 On Martin Luther King, Jr. Day, many of us on Twitter made our own versions of the Disappearing Pinwheel quilt from the Missouri Star Quilt Company, here and here. 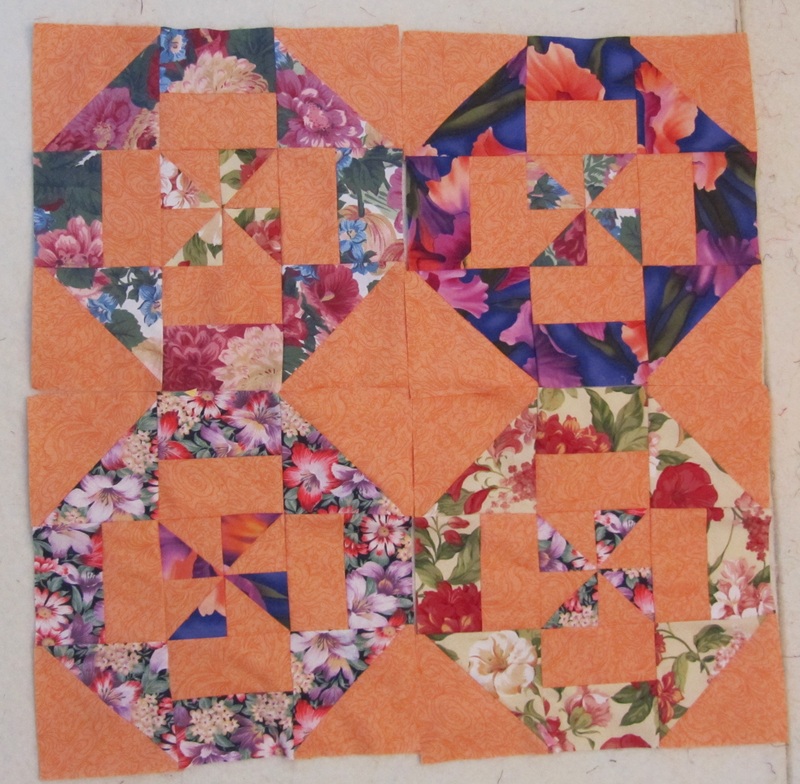 I’m using large scale florals, and switching out the centers. The background doesn’t photograph very well, but it’s a light peach, toward the orange side. I’ve completed a dozen blocks, and it won’t take long to finish the rest. I’m not completely sure what I want to do with it, but it has been fun to work on with folks from all around the world. Here are a few photos, and it’s worth checking back to see more. 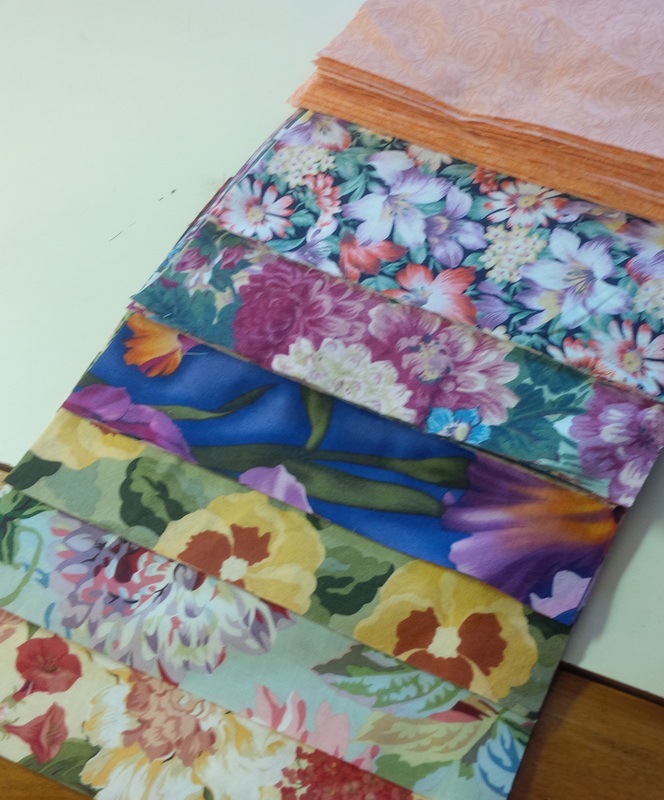 Our fabrics choices are very different! Hope you’re making the progress you would like, and staying warm, if you’re in the eastern US! Categories: Uncategorized | Tags: Evening in the Garden, Valerie Root, wip wednesday | Permalink. The stash got the upper hand this week, as my fabric arrived from eQuilter, and my work on the Brights quilt dragged on progressed slowly. 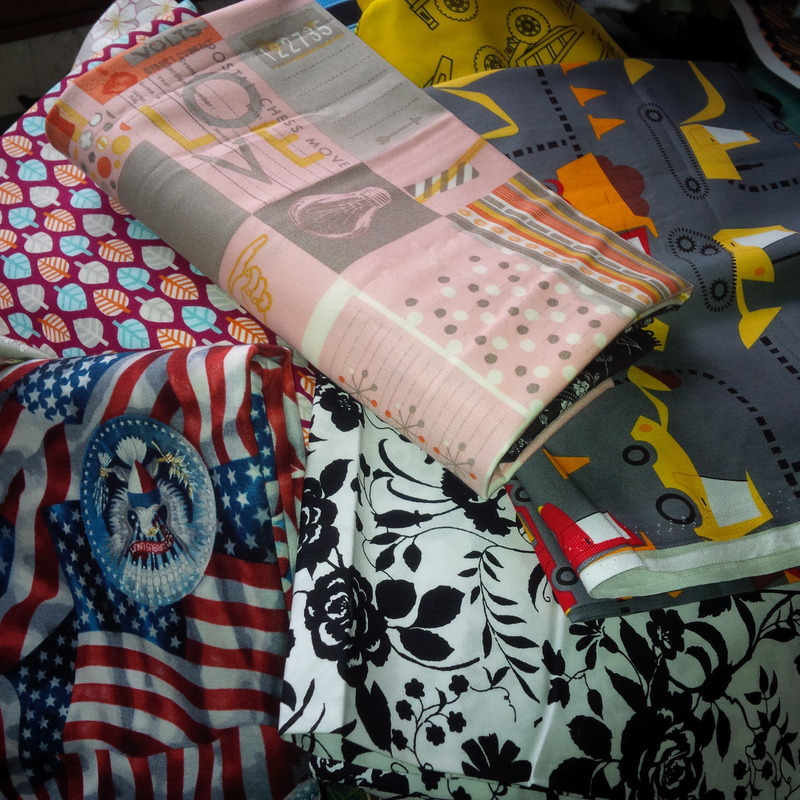 The fabric is wonderful, from their big clearance sale between Christmas and New Years. I know they have another of these big sales around Memorial Day or Labor Day (both? ), but there’s always good stuff in their clearance section. Some of this is already designated for projects, so it will go fast. 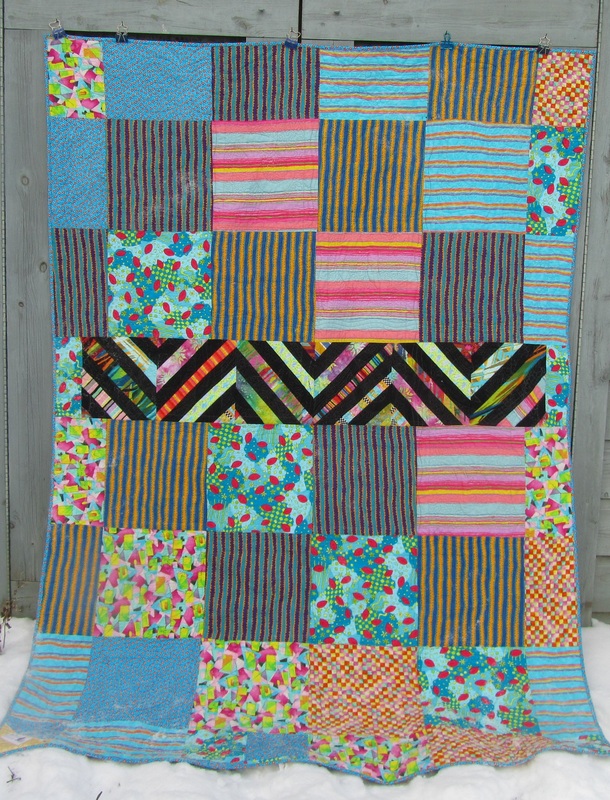 The Brights quilt will probably be finished later today, so it will definitely be a lot of yards counted out next week. My back is better but still sore, so I am trying not to sew for too long at a time. 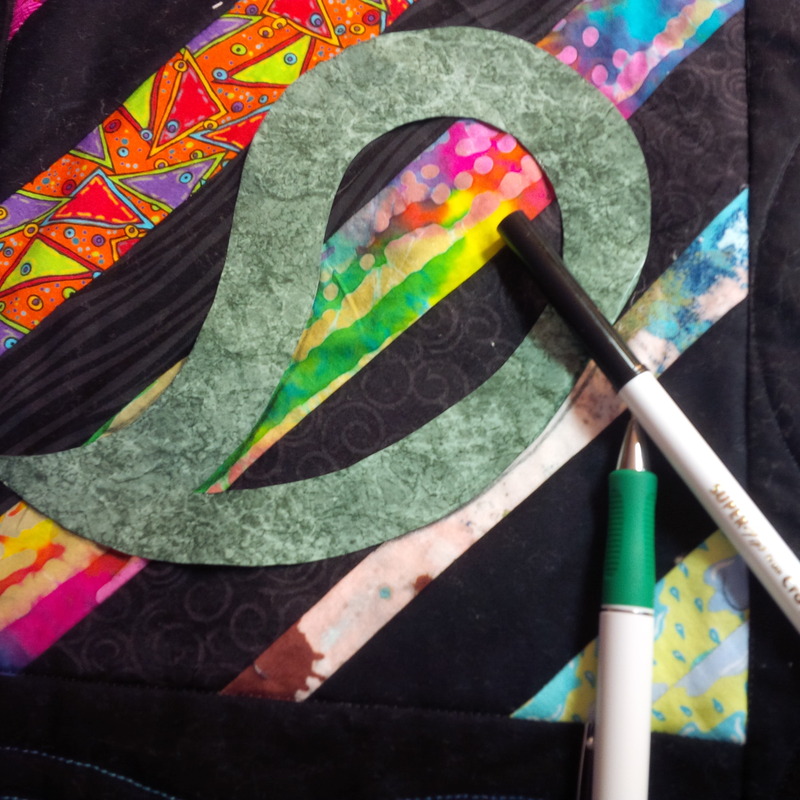 Also, I vastly increased the amount of quilting I planned to do on this project, but it is advancing my goal of learning new quilting motifs, so it’s been a good snowbound project. Well, I missed the linkup, but I’ll put this out here anyway for those of you who follow. 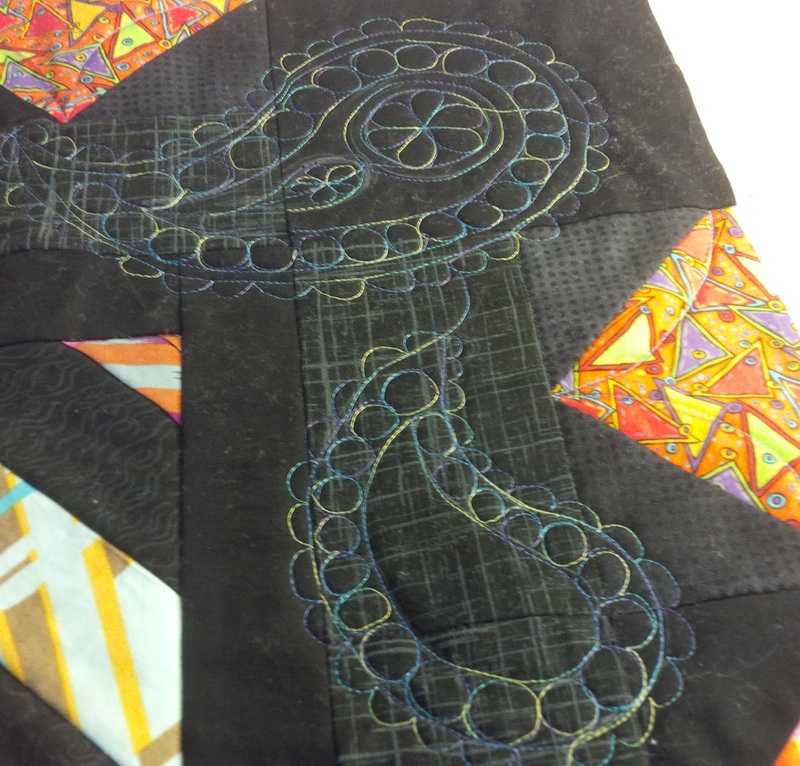 Today I’m on to quilting the sashing, probably with wavy lines using the walking foot, and then fmq-ing the blocks and borders with paisley designs. 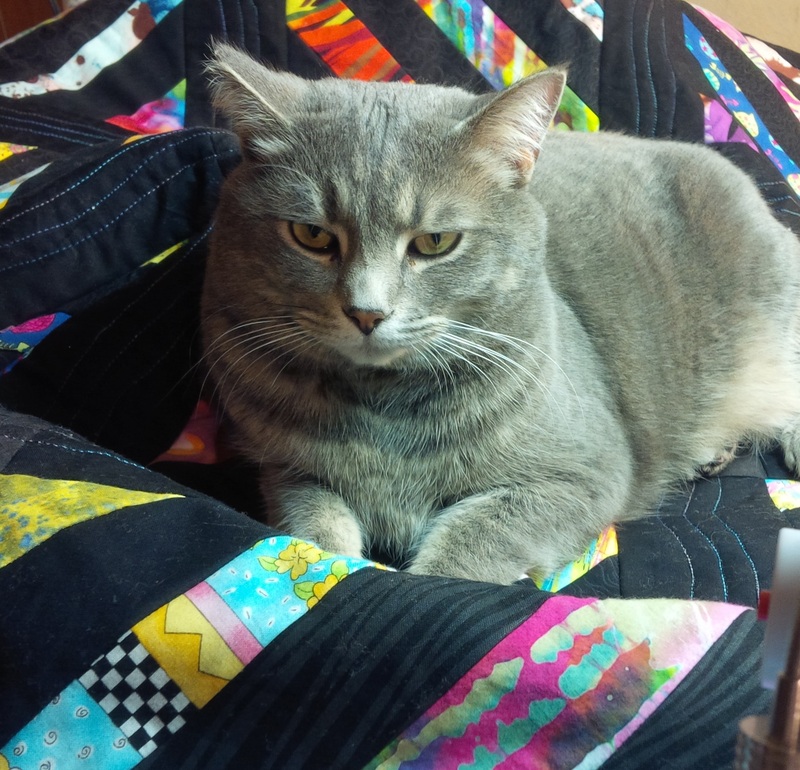 Meanwhile those enablers quilters on Twitter, known as the #Twilters, have drummed up a new quilting bee. during our Martin Luther King Day Sew-In ( #MLKSI ). In typical #Twilter fashion, this is morphing into a whole weekend of fun and silliness, so check out the blogs and podcasts to see what’s going on. Google Hangouts have been mentioned (still no success fixing my webcam…), and there will probably be a Flickr group, so you can participate even if you’re not a Twitter person. I hope you’ll join us. if they talk me into it. And the new step has been released for Scrapitude, so I’ll be plenty busy. Hope you’re make progress on something. Categories: Uncategorized | Tags: #scrapitude, disappearing pinwheel, Evening in the Garden, Valerie Root, wip wednesday | Permalink. Nothing in, and nothing out this week. I’ve been working away at the Bright Strings quilt, and the back (all from stash as well) is almost finished, but it’s progressing at a snail’s pace. I’ve had back spasms all week and can’t sit at the machine for very long at a time. Hopefully it will get finished this week. 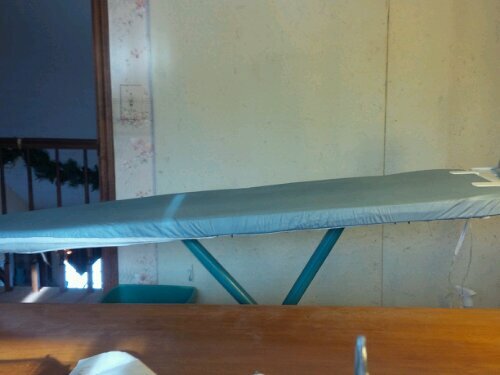 In other news, I have a new ironing board. My tall son leaned on the old one, bending the legs and producing a permanent slant. I don’t know how obvious the problem appears here, but a.) Yuri kept rolling off, and b.) I kept cursing as the fabric and iron slid off. The new one is Bed Bath and Beyond’s “professional” model. It was too expensive, but I used a coupon. I wanted one quickly, and the main review complaint on the ones from Amazon was that they were arriving damaged, so I went with this. 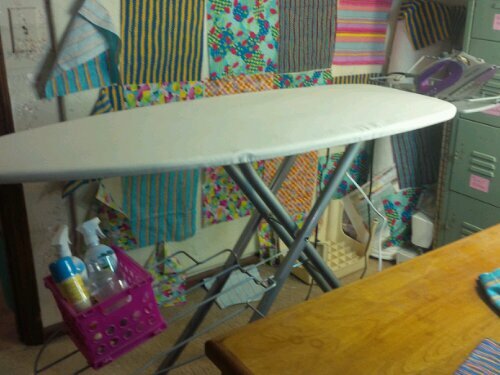 It is 18″ wide, which I like, and it has it’s own electrical cord and outlet for plugging in the iron, so I am no longer fighting the cord as I iron. It has a built in iron rest and cord guide. The padding seems pretty thin and the cover is a rough, cream colored fabric, but I guess I know how to fix those things. Since I haven’t been in the studio much, I haven’t really used it a lot, but so far, so good. Hope you’re using your stash this year. Categories: Uncategorized | Tags: Evening in the Garden, Stash Report, string quilt, Valerie Root | Permalink.